What began as an idea between two friends turned into a LGBTQ+ Pride event that drew hundreds of people on Sunday. The event began as an idea between two local teens, Celeste Harrell and Lillian Rust. Harrell said the concept began with a single conversation and a schedule conflict. Initially, Harrell and Rust expected around 70 people. Word spread quickly about the Pride event on social media, however. The end result was a significant local turnout alongside many who drove from Anchorage or elsewhere in the Mat-Su to participate. One of the people who made the drive is RJ Johnson, who grew up in Talkeetna, but now lives in Anchorage. Johnson is used to being on the planning end of Pride events. He said seeing his hometown celebrate in the very park where he played growing up is special. After about an hour of mingling, the parade began. As they made the customary two laps of Main Street, parade participants were greeted with waves and cheers from spectators. 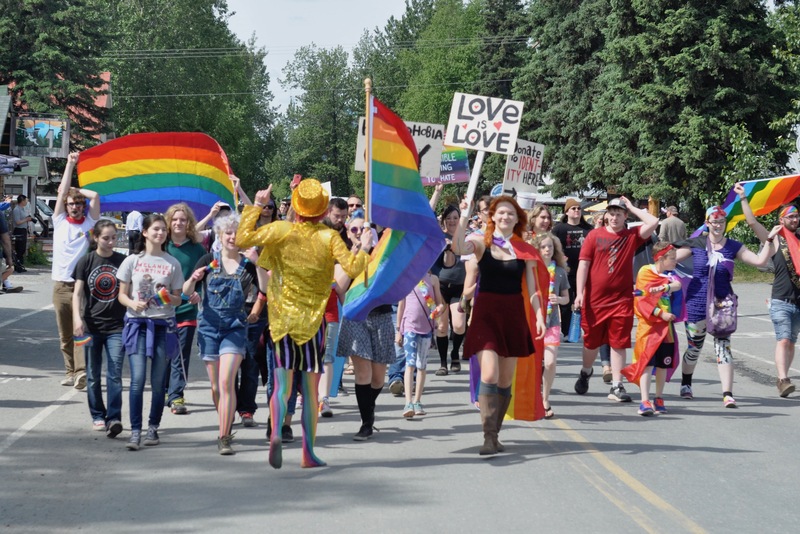 For a short while, Talkeetna’s bustling summer activity stopped as rainbow flags, signs, and chants filled the street. After the parade, the celebration continued in the village park. Lillian Rust said she is grateful for everyone who supported Talkeetna’s first Pride parade. While no official plans are being made yet, many who attended Talkeetna’s first Pride celebration say they hope it’s not the last.